Yesterday we enjoyed three musical events, back to back, at Juilliard, having decided that music feeds the soul even more than food feeds the body. It was a truly glorious day and indicated the depth and breadth of talent at Juilliard. We began with a recital by bass William Guanbo Su who, in addition to finalizing his Master of Music degree from Juilliard, just advanced in the Metropolitan Opera National Council competition and has been sharing his artistry all over the map. We have followed Mr. Su since his undergraduate days at Manhattan School of Music and will never forget his performances as the Badger and the Parson in Janacek's Vixen Sharp-Ears. We noted his facility with languages in his graduation recital, as well as the unique qualities of his instrument. We have been there for numerous galas in which his artistry was recognized and honored with prizes. This is an artist destined for major success. 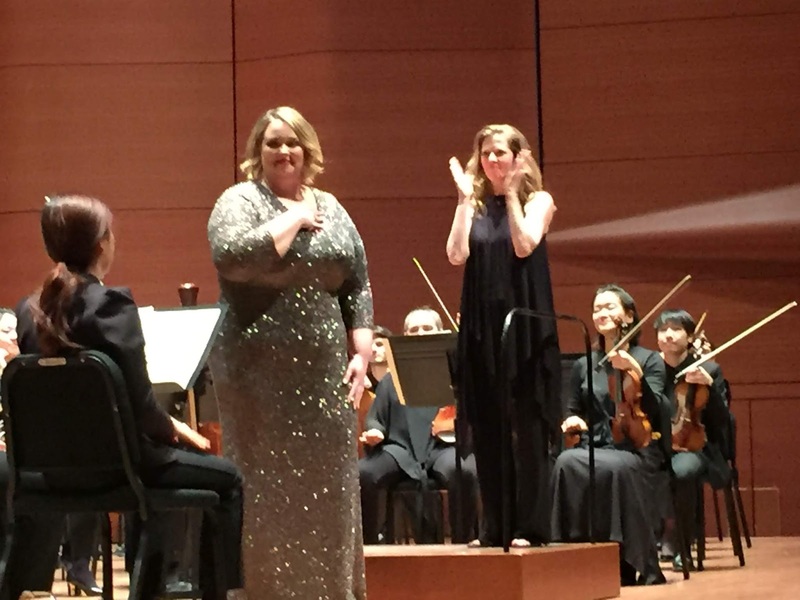 In yesterday's recital, we saw another side of his artistry which confirmed our belief that American musical theater, when sung by operatically trained voices without amplification, is the direct descendant of European opera. In the second half of the recital, Mr. Su sang "Stars" from Claude-Michel Schönberg's Les Miserables and two selections from Rodgers and Hammerstein's South Pacific. The performance was direct and communicative. We loved it! We also enjoyed Eric Coates' "Bird Song at Eventide" from the early 20th c. Mr. Coates chose some lovely poetry which rhymed and scanned, thus being inspired to create a melodic vocal line. Richard Fu Yu's piano provided the birdsong. Mr. Su has perfect English diction and made every word count. He also delighted the audience with his encore, sitting at the piano and accompanying himself as he sang a Mongolian folk song. We didn't know about his secret talent. The communicative aspect that so delighted us in the second half of the program was impaired in the first half by the use of the detested music stand. No matter how hard a singer tries to communicate, the spell is broken when he glances down at the music. We are sure that Mr. Su's recent occupation with performing and competing was the cause but we couldn't help but feeling cheated out of our full enjoyment of our favorite two Bellini songs. Truth to tell, we have never enjoyed Brahm's Vier ernste gesänge due to their unrelieved grimness but feel they were chosen to highlight Mr. Su's superb lower register. As far as Poulenc's cycle La Bestiare, he successfully met the challenge of the higher register but needed more variety. We found our attention wandering to the piano, as it does when the singer doesn't connect. We heard the variety we wanted in Mr. Yu's piano. Because of the success of the second half of the recital, which was performed off the book, we left satisfied and ready for more music. It was my great good fortune to attend a vocal arts showcase directed by Jenny Lord. It is your misfortune that reviews are not permitted. Suffice it to say that the students involved introduced the several opera scenes and we were gloriously entertained. If you, dear reader, only knew how difficult it is not to review! 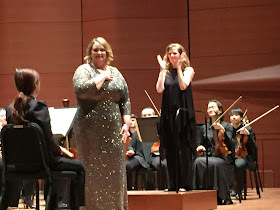 Coasting along on our musical high, we were treated to a marvelous concert by the Juilliard Orchestra, which responded brilliantly to the exciting double threat/double treat young conductor/soprano Barbara Hannigan. The concert grabbed our attention from the start and kept up momentum until the final note. Richard Strauss' "Salome's Dance" from his opera Salome gets off to a frenzied start, well suited to Mo. Hannigan's energetic and poetic conducting style. The sensual Middle-Eastern melodies accompanying the dance were given to the flute and the percussion section provided the bombast. Although Mo. Hannigan did not shed any of her graceful chiffon attire, one could see that she was living through the dance. And the orchestra followed her lead. Strauss' massive orchestra was reduced for Haydn's Symphony No. 96 in D Major, which stands as a lesson in the writing of a Classical symphony. The opening movement in Sonata-Allegro form introduced two contrasting themes, followed by an intricate development section in which one could still recognize the themes, prior to the recapitulation. A lilting Andante was followed by a charming Menuet in 6/8 time. The final sprightly movement--Vivace--was a perfect example of perpetuum mobile. When a long sweeping phrase occurred, Mo. Hannigan swept her arm in a long graceful arc. Claude Debussy's "Syrinx" gave flutist Emma Resmini a chance to shine with pure tonal quality and lovely phrasing, not so different from the artistry of the singer. In our mind's eye we visualized a mythical world of cavorting nymphs and satyrs. Without a break the Debussy led into what was, for us, the highlight of the evening. Insert fanfare! Soprano Meghan Kasanders sang in Finnish "Luonnotar", the opening verses of Jean Sibelius' tone poem based upon the Kalevala, a creation myth peculiar to that culture. As Ms. Kasanders neared the end, where the cracked shell of the seabird became the vault of heaven, her voice soared magnificently. Ms. Kasanders has always impressed us with the size of her voice and the manner in which she uses it. What a treat that was! We were inspired to attend the upcoming Kulervo, performed by the Oratorio Society, wanting more of this glorious music. We would have been content to have ended it at that glorious moment but there was one more piece on the program, Béla Bartok's Suite from The Miraculous Mandarin. This is a raucous and dissonant piece of music with a few graceful passages interspersed which were steeped in Oriental eroticism. Guess which parts we favored! And so our long day and evening came to a glorious end with a renewed appreciation for Juilliard's glories.